The adrenal glands are located near the kidneys and produce several essential substances that regulate a variety of body systems that are necessary for the body to function normally. The most widely known of these substances is cortisol, commonly known as cortisone. An abnormal level, either too little or too much, of any of these essential substances, especially cortisol, may be life-threatening. There are 3 types of Cushing's disease and all 3 have the same symptoms. "It is important to identify the type of Cushing's disease because the various forms are treated differently and each has a different prognosis." It is important to identify the type of Cushing's disease because the various forms are treated differently and each has a different prognosis. 1) Pituitary gland tumor. The most common cause of Cushing's disease (approximately 85% of all cases) is a tumor of the pituitary gland, which is located at the base of the brain. The tumor may be either benign or malignant. The tumor causes the pituitary gland to overproduce a hormone that stimulates the adrenal glands to produce cortisol. The tumor may be microscopic or large. Depending on the size of the tumor, clinical signs other than Cushing's disease may develop. 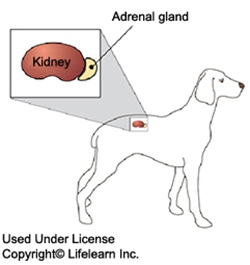 Generally, if the activity of the adrenal gland can be controlled, many dogs with this form of Cushing's disease can live normal lives for several years, as long as they take their medication and stay under close medical supervision. 2) Adrenal gland tumor. Cushing's disease may be the result of a benign or malignant tumor of the adrenal gland. If the tumor is benign, surgical removal cures the disease. If malignant, surgery may help for a while, but there is a high probability that the malignant cancer had already spread to other parts of the body before the condition was diagnosed. 3) Iatrogenic. Iatrogenic Cushing's disease means that the excess of cortisol has resulted from excessive administration of a steroid medication. This may occur from the prolonged use of oral or injectable medications. Although the injections or tablets are often prescribed for a valid medical reason, prolonged use or misuse can cause Cushing's disease as a detrimental side effect. Triamcinolone, prednisone, prednisolone, methylprednisolone and cortisone are some common corticosteroids that can cause Iatrogenic Cushing's disease if given at high doses for long periods of time. Caution should also be used when some "natural" supplements are used, such as plants containing natural sterols, since anything that contains steroid-like compounds is capable of causing Iatrogenic Cushing's disease. The most common clinical signs associated with Cushing's disease are an increase in appetite, water consumption, and urination. Lethargy, or lack of activity, and a poor or thinning hair coat are also common symptoms. "Many dogs with hyperadrenocorticism develop a bloated or "pot-bellied" appearance..."
Many dogs with hyperadrenocorticism develop a bloated or "pot-bellied" appearance to their abdomen due to an increase of fat within the abdominal organs and a weakening and stretching of the abdominal muscle wall as the fat accumulates and the organs get heavier. Panting and changes in sleep patterns or restless behavior are other common findings with this disease. A number of tests are necessary to diagnose and confirm Cushing's disease. The two most common tests to detect Cushing's disease are the ACTH Stimulation Test and the Low-Dose Dexamethasone Suppression (LDDS) test. Other tests are needed to determine which form of the disease is present. Endogenous ACTH levels, High-dose Dexamethasone Suppression (HDDS) test, urine cortisol:creatinine ratio, and 17-hydroxyprogesterone response to ACTH administration tests may also be recommended. "An abdominal ultrasound examination can be a valuable part of the testing process." An abdominal ultrasound examination can be a valuable part of the testing process. This permits visualization of the adrenal glands, detecting the presence of a tumor and whether one or both adrenals are affected. Although some of these tests are somewhat expensive and a few require hospitalization for up to eight hours, they are necessary to determine the best treatment and prognosis for your pet. What are the treatment options for iatrogenic Cushing's disease? Treatment of this form requires a discontinuation of the steroid that is being given. "Must be done in a controlled manner so that other complications do not occur." This must be done in a controlled manner so that other complications do not occur. Unfortunately, it usually results in a recurrence of the disease that was being treated by the steroid. Because there may have been other adverse effects on the adrenal glands, additional treatment may be needed to correct that problem. Some pets will have developed other conditions associated with the steroid usage that are only apparent as the medication is being withdrawn. What are the treatment options for an adrenal tumor? Treatment of an adrenal tumor requires major abdominal surgery. Although this is a technically demanding surgery, if it is successful and the tumor is not malignant, there is a good chance that the dog will regain normal health and enjoy a normal life expectancy. If surgery is not an option, some of these patients can be managed with medication, with varying results, as discussed below. What are the treatment options for a pituitary tumor? "Treatment of the pituitary-induced form of Cushing's disease is the most complicated." Treatment of the pituitary-induced form of Cushing's disease is the most complicated. There are several drugs commonly used: Anipryl® (selegiline hydrochloride), Lysodren® (mitotane), Vetoryl®(trilostane) and ketoconazole. Lysodren is the most commonly used medication in the treatment of Cushing's disease. Anipryl® and Vetoryl® are the only drugs approved by the FDA. Anipryl® is given daily and has little, if any, side effects. Few blood tests are required when using this medication. Anipryl works directly on the pituitary gland, helping produce more of the hormones that may be diminished with Cushing's disease. Most pets with uncomplicated Cushing's disease (no complications such as diabetes mellitus, etc.) can be successfully treated with Anipryl. If a pet does not improve after two to three months of Anipryl® therapy, Lysodren® therapy is often recommended. Unfortunately, newer research demonstrates that only a minority of dogs will respond to treatment with Anipryl®. Lysodren® is used to destroy the abnormal adrenal gland tissue and is the most common treatment for canine Cushing's disease. Lysodren® is also known as mitotane or o,p'-DDD. If too little of the drug is used, the abnormal adrenal tissue persists and the disease continues. If too much is used, most or all of the adrenal cortex will be destroyed, which can be life threatening due to deficiency of the vital hormones produced by the adrenal glands. This condition is known as Addison's disease or hypoadrenocorticism (for further information, see the handout "Addison's Disease"). "Because the pituitary is not being affected by the treatment, it continues to stimulate the adrenal gland." Careful monitoring of the dog is necessary in order to achieve good results. Because the pituitary is not being affected by the treatment, it continues to stimulate the adrenal gland. This means that lifelong treatment is necessary. Vetoryl (trilostane) is a newer drug that acts in much the same manner as Lysodren®. Patients experience fewer side effects and there is less risk of developing hypoadrenocorticism compared to Lysodren®. This drug has been recently approved for use in dogs in the USA and Canada. Your veterinarian can evaluate if trilostane is a viable treatment option for your pet. Lifelong treatment is required. Ketoconazole is an anti-fungal drug that has been successfully used for many years in the treatment of Cushing's disease, although it is not approved for use in dogs for this condition. 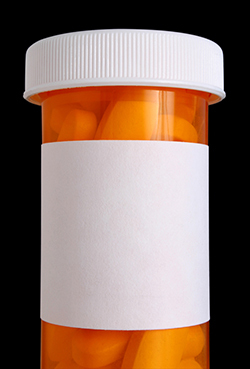 Side effects include potential liver damage; dogs receiving ketoconazole must be closely monitored, as with mitotane and trilostane. Lifelong treatment is required. 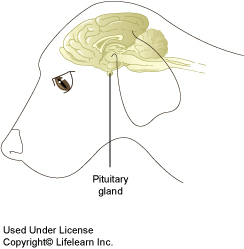 Transsphenoidal pituitary surgery (approach via incision through the palatine mucosa, or roof of the mouth) is an emerging surgical technique being performed in advanced veterinary surgical facilities. This approach involves the use of ultrasound, CT or MRI-assistance. In a 2004 study, this procedure had a high overall success rate. While currently only being performed at teaching and research institutions, consult with your veterinarian about the availability of this procedure in your area. This surgery is commonly performed in humans diagnosed with Cushing's disease. What is the prognosis for Cushing's disease? Except for Iatrogenic Cushing's disease, cure is not possible with medical treatment alone. "...medical control is possible for many years..."
If caused by a benign tumor, medical control is possible for many years if the tumor remains small. If a pituitary tumor is large or continues to grow, local effects of the tumor on surrounding tissues in the brain can be the limiting factor in survival. Your veterinarian will determine the best diagnostic and treatment options for your dog.